Preface. List of contributors. 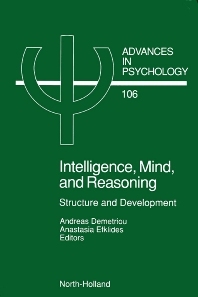 Intelligence, mind and reasoning: Three levels of description (A. Demetriou, A. Efklides). Part I. Intelligence and Mind. A person-situation interaction theory of intelligence in outline (R.E. Snow). Taking stock of what there is: The case of cognitive abilities. (J.O. Undheim). Hierarchical models of intelligence and educational achievement (J-E. Gustafsson). Structure, development, and dynamics of mind: A meta-Piagetian theory (A. Demetriou, A. Efklides). The older child's theory of mind (W.V. Fabricius, P.J. Schwanenflugel). Part II. Mind and Reasoning. Reasoning, metareasoning and the promotion of rationality (D. Moshman). The structure and development of propositinal reasoning ability: Cognitive and metacognitive aspects (A. Efklides, A. Demetriou, Y. Metalidou). Reasoning models and intellectual development (L. Smith). A representational communication approach to the development of inductive and deductive logic (P.E. Langford, R. Hunting). Concluding Chapter. Gulliver Ravel's travels: An excursion to the theoretical islands of intelligence (R.J. Sternberg). Name index. Subject index. This volume aims to contribute to the integration of three traditions that have remained separate in psychology. Specifically, the developmental, the psychometric, and the cognitive tradition. In order to achieve this aim, the text deals with these three aspects of human knowing that have been the focus of one or more of the three traditions for many years. Answers are provided to questions such as the following: What is common to intelligence, mind, and reasoning? What is specific to each of these three aspects of human knowing? How does each of them affect the functioning and development of the other? The chapters are organized into two parts. Part I focuses on intelligence and mind and has reasoning at the background. The papers in this part present new theories and methods that systematically attempt to bridge psychometric theories of intelligence with theories of cognitive development or information processing theories. Part II focuses on mind and reasoning and has intelligence at the background. The papers in this part develop models of reasoning and attempt to show how reasoning interacts with mind and intelligence. Two discussion chapters are also included. These highlight the convergences and the divergences of the various traditions as represented in the book.